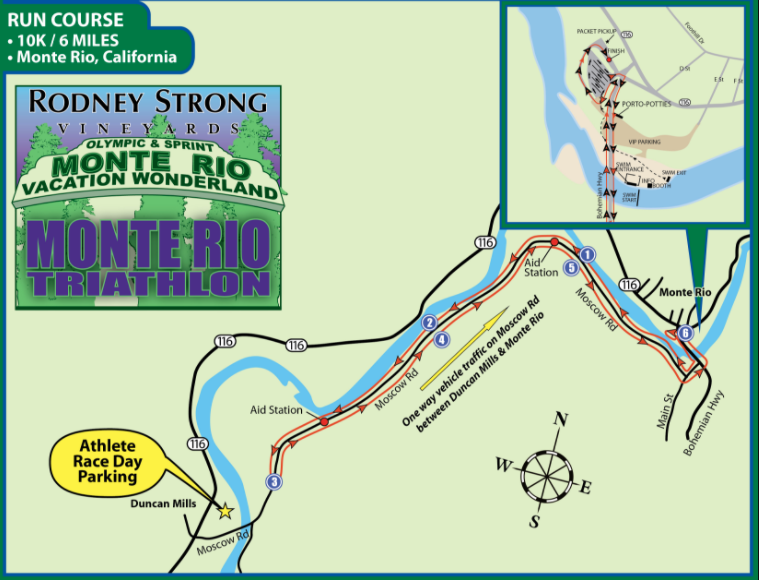 The 1.5k (.93 Mile) and 750m (.47 mile) swims are staged in the Russian River at Monte Rio Beach in the town of Monte Rio, CA. Water temperatures are typically between 65 and 70 degrees. If this is the case on race morning, wetsuits will be allowed as this falls within USA Triathlon guidelines. 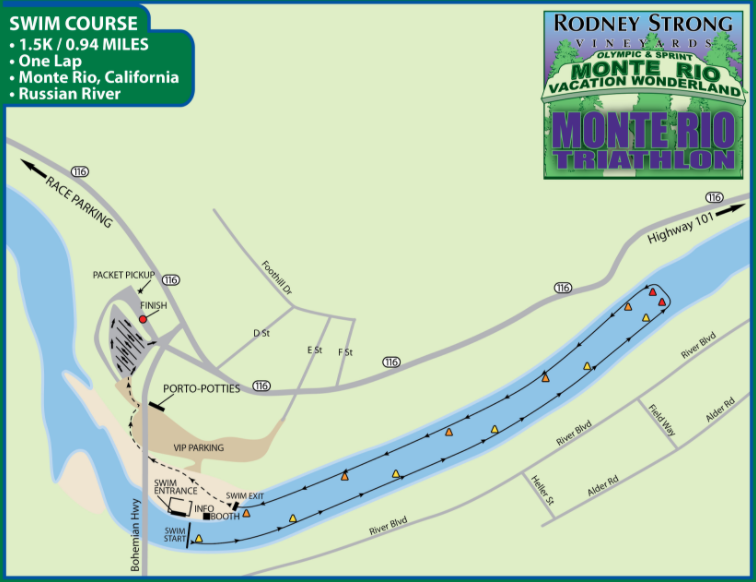 The swim courses are out and back courses which start just east of the bridge in Monte Rio. They will proceed upstream for .75k (Oly) and 375m (Sprint) to the turn-around point where athletes will return to the starting point to exit the water. Swimmers will keep the swim buoys on their left for the entire swim. The course, which averages between 3 and 8 feet in depth, will be monitored by lifeguards in kayaks. 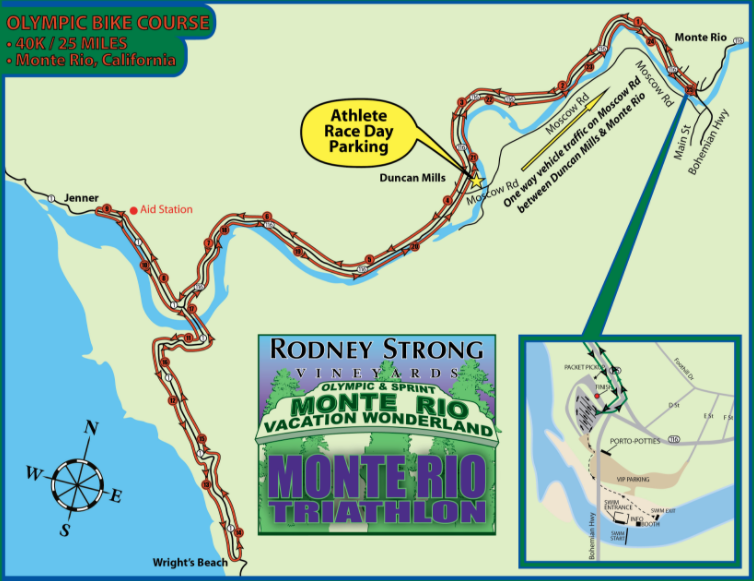 The 40K (24.8 Mile) and 20K (12.42Mile) bike courses will take the racers from Monte Rio through redwood trees, along the Russian River, and past coastal pasture land. The Olympic distance course will also take the athletes out to the quaint coastal town of Jenner and then south on Hwy. 1 to the turnaround at Wright’s Beach. The bike course is on CA 116 and Hwy. 1, which both have very good surfaces. Only those in the Olympic distance race will pass the aid station. The 10K (6.2 Mile) Olympic run course is an out & back flat,shaded course with aid stations located at the transition area, 1.2 miles, 2.5 miles, 3.5 miles and 5 miles.The 5K (3.1 Miles) Sprint run course follows the same course and will have one aid station that you will pass by twice – at 1.2 miles and at 1.9 miles. Take Highway 101 north to the River Road/Guernveille exit (the first exit north of Santa Rosa). At the off ramp go left (west) on River Road. Travel 19 miles to the town of Monte Rio. Turn left immediately after Fern’s Market, down the dirt drive. Take Highway 101 south to the River Road/Guerneville exit. At the off ramp go right (west) on River Road. Travel 19 miles to the town of Monte Rio. How was Monte Rio Triathlon?